Recently for a friends Frozen theme birthday party, I decided to try my hand at freestyle decorating. Up until this point I had only done the shaped pan, colour by number type of decorating. It wasn’t a conscious decision, it was born out of the fact that since Frozen is such a new movie, there were no decorating pans or kits yet in existence. 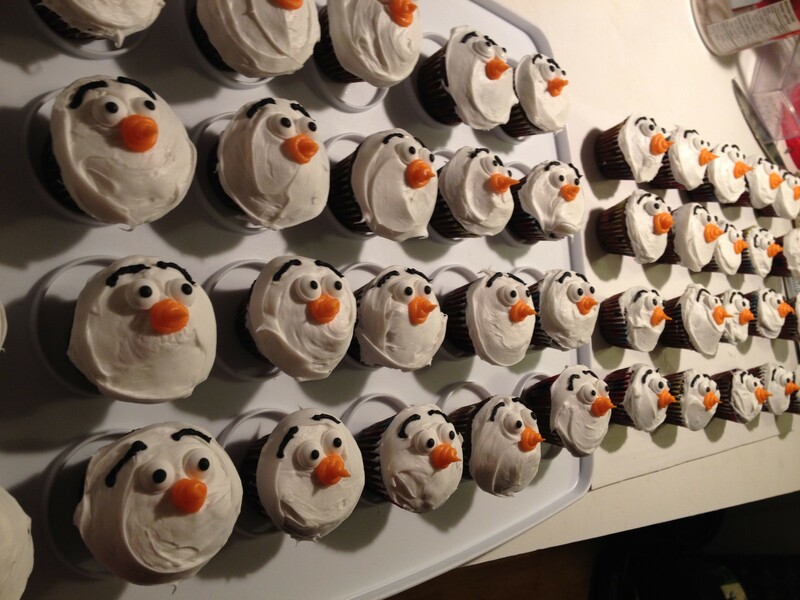 I settled on a small Olaf cake (that tutorial can be found here) and 4 dozen mini cupcakes. I must say, the cake was MUCH easier than trying to make 48 small round circles look like a character with an odd-shaped oblong head. I will fully admit to using a cupcake mix and premade icing for the venture. My rule of thumb is if I have to spend a significant amount of time decorating, then I want to spend as little time baking as possible! My go to’s are the Duncan Hines Devils Food Cake and Fluffy White Whipped Frosting in the same brand. I found these super cute snowman mini cupcake liners that matched the theme perfectly! Unfortunately with the oil used in the cake batter, the liners were translucent coming out of the oven. Next time I’m using any sort of white liner, I will double up and use 2 liners per cupcake and hopefully they will stay nice and white. Once the cupcakes were baked and cooled, it was time to decorate! I try to bake 2 days before the event, let it cool overnight and decorate one day before the event so there is lots of time should anything go wrong. Given that I had no model to work from, I decided to completely decorate one cupcake and use it as a guideline for all the others. Once the cupcake was iced, I added 2 Wilton Candy Eyeballs and the arching eyebrows. So far, so good. I toyed with the noses, trying to decide between an 3D vertical spiral nose and a 2D horizontal triangle nose, but the hardest part by far was the mouth. Since I was decorating mini cupcakes, there simply wasn’t much room to work with. A lot of black icing on the cupcake looked a bit scary and trying to raise the profile of the mouth left him looking more like a bunny then a snowman. No matter what I tried, I just couldn’t get it right! After a few hit and misses, I had an “aha” moment! 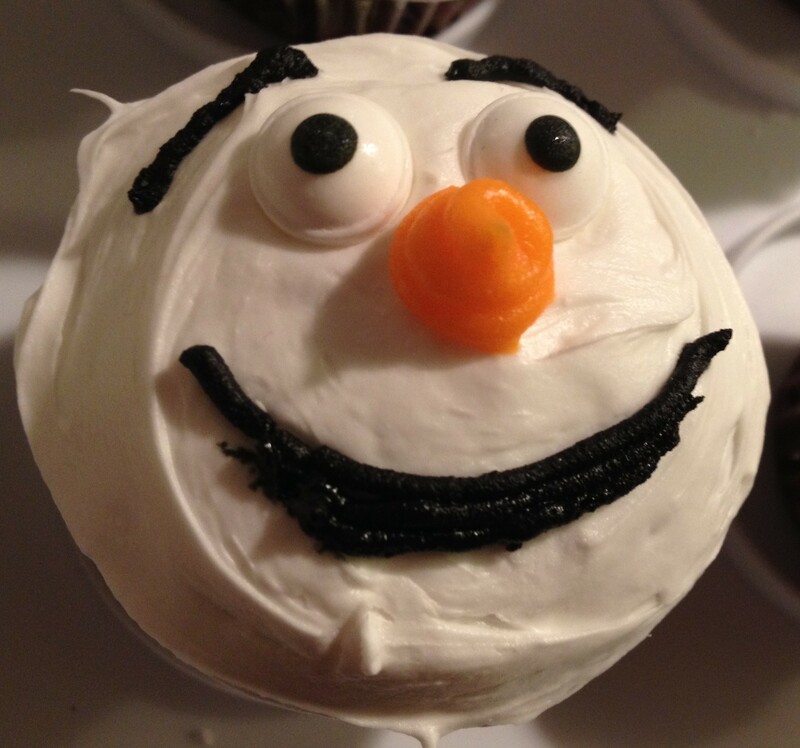 I realized that no matter what I did, a round cupcake wasn’t going to look exactly like Olaf with his oddly shaped, oblong head. The full sized cake was a pretty good likeness, so I had to let go of my perfectionist tendencies and aim for the best resemblance I could get given my limitations. Once I wrapped my head around that, I focused on the mouth and teeth – defining features that I could control – and settled on a model I was happy with. Then I got to assembling the rest of the ‘Olaf army’. I iced the cupcakes with the fluffy white icing and then started playing with the fondant. I decided to use Wilton’s Ready to Use White Rolled Fondant to make Olaf’s signature prominent teeth. I didn’t bother to roll it out with a rolling pin, I simply ripped off a piece and worked it in my hands until it was pliable. I broke off small pieces and made a mountain of teeth! Before adding the teeth to the cupcakes, I started with the candy eyeballs. 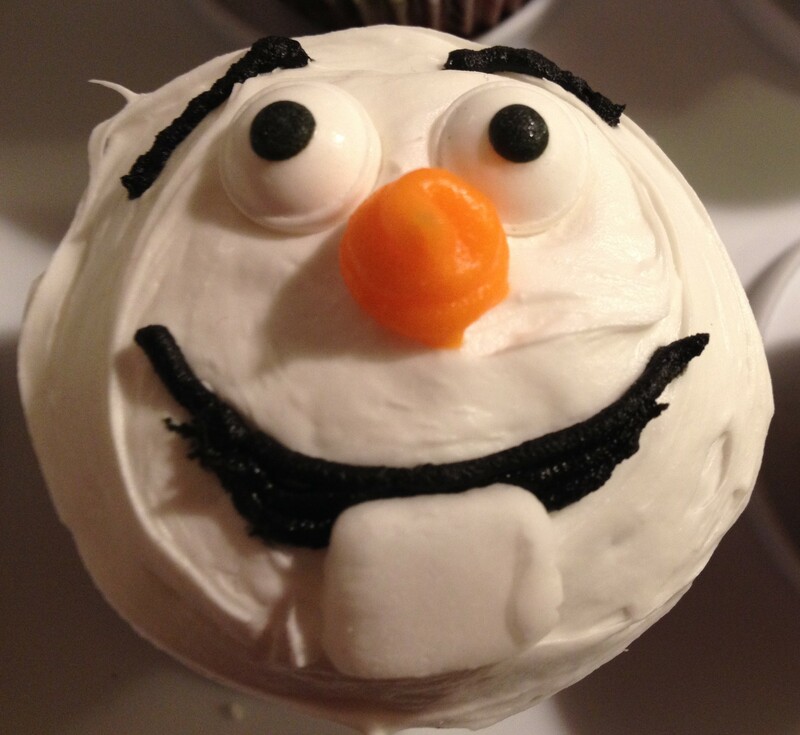 Once there were 2 eyeballs on each Olaf, I grabbed a Ready to Use Black Icing Tube and popped a #2 Round Decorating Tip on the end and secured it with a Coupler Ring. Anytime I need to decorate with black icing I always use ready to use icing as trying to mix up black icing using icing colour is impossible. No matter how much colouring you use it is always a dark grey, never black. Trust me, to save lots of time and frustration, grab ready to use black (same applies for red icing too)! 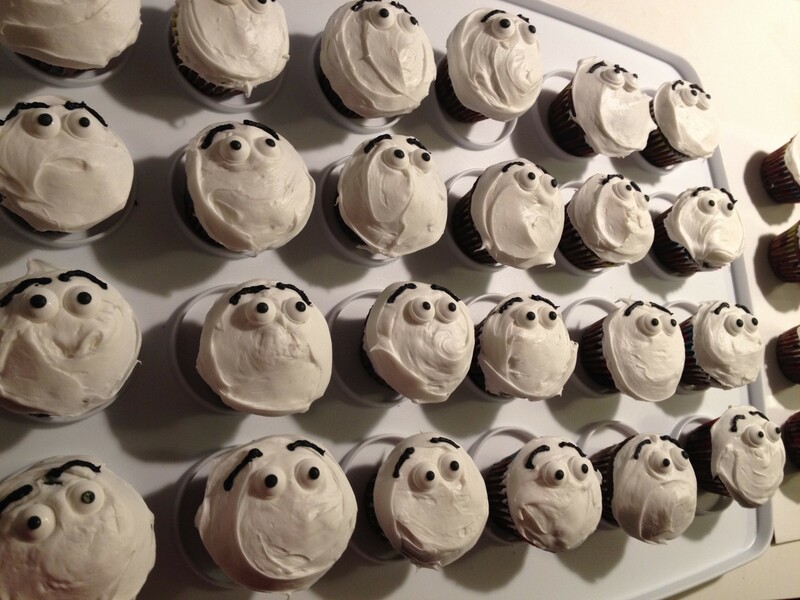 I used the black icing to pipe in eyebrows above the candy eyeballs. 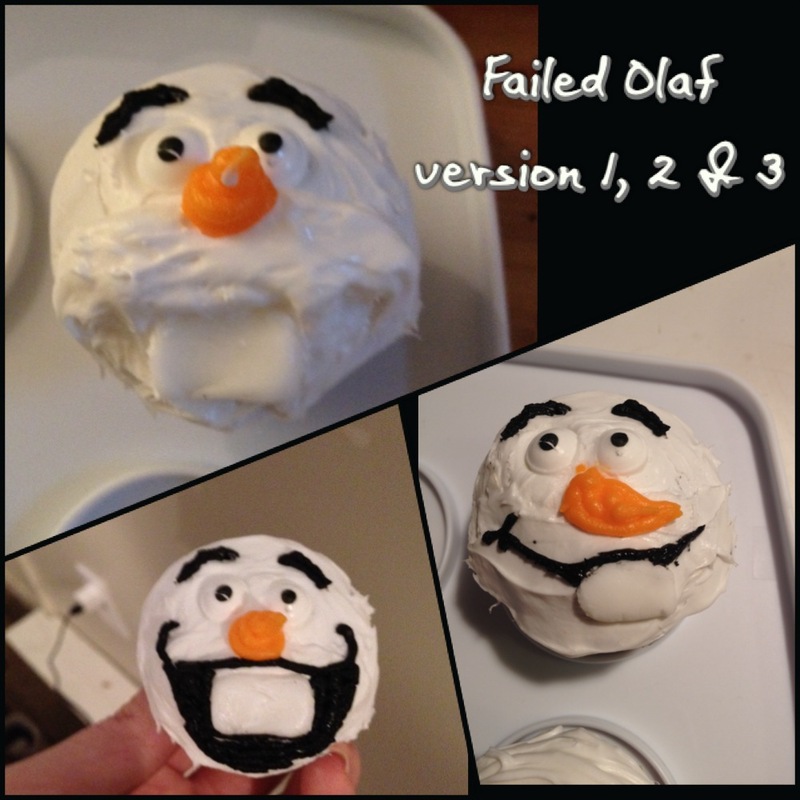 Olaf Cupcake Tutorial – here’s lookin at you! The noses were next, and again I used a Ready to Use Icing tube in Orange, topped with a larger #5 Round Decorating Tip. In my experimenting before I settled on the 3D profile nose instead of a 2D horizontal triangle nose. I swirled a round cone a la Dairy Queen right underneath the candy eyes. Last came the mouth and teeth. I went back to the black icing with the number 2 tip. In my testing I found that the large open mouth overwhelmed the mini cupcake, so I went with a simple line smile and tripled it to give it a bit of depth. 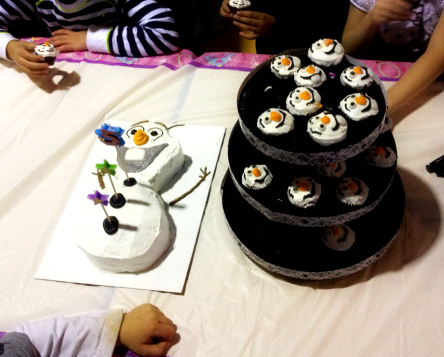 The finishing touch was popping one fondant tooth in the middle of each smile, and voila – Olaf was ready to go! The mini cupcakes were a big hit and enjoyed by all!